Lightning in the clouds is directly linked to events that produce some of the highest-energy light naturally made on Earth: terrestrial gamma-ray flashes (TGFs). An instrument aboard NASA's Fermi Gamma-ray Space Telescope was recently fine-tuned to better catch TGFs, which allowed scientists to discover that TGFs emit radio waves, too. The outbursts, known as terrestrial gamma-ray flashes (TGFs), last only a few thousandths of a second, but their gamma rays rank among the highest-energy light that naturally occurs on Earth. The enhanced GBM discovery rate helped scientists show most TGFs also generate a strong burst of radio waves, a finding that will change how scientists study this little understood phenomenon. 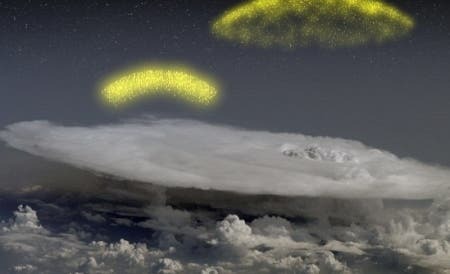 NASA’s scientists also observed antimatter structures formed above thunderstorms on Earth, a phenomenon which until recently was not seen before. Scientists believe the antimatter explosions are formed due to a short burst of energy inside the storms such as the lightning. It is thought that about 500 such antimatter beams are generated daily in terrestrial gamma-ray flash but most of them remain unobserved. The antimatter beams were detected by Fermi Gamma-Ray Telescope which is used to monitor gamma rays, the highest energy light form. If antimatter hitting Fermi Telescope collides with a matter particle, both particles quickly annihilate each other releasing gamma beams. So far Fermi has recorded gamma radiation with energies of 511,000 eV, a signal showing that an electron has collided with its antimatter counterpart, a positron. Fermi GRT’s discovery was a great one regarding the fact that people invested billions in facilities for production of antimatter. Thanks to improved data analysis techniques and a new operating mode, the Gamma-ray Burst Monitor (GBM) aboard NASA's Fermi Gamma-ray Space Telescope is now 10 times better at catching the brief outbursts of high-energy light mysteriously produced above thunderstorms. Before being upgraded, the GBM could capture only TGFs that were bright enough to trigger the instrument's on-board system, which meant many weaker events were missed. "In mid-2010, we began testing a mode where the GBM directly downloads full-resolution gamma-ray data even when there is no on-board trigger, and this allowed us to locate many faint TGFs we had been missing," said lead researcher Valerie Connaughton, a member of the GBM team at the University of Alabama in Huntsville (UAH). The results were so spectacular that on Nov. 26 the team uploaded new flight software to operate the GBM in this mode continuously, rather than in selected parts of Fermi's orbit. Connaughton's team gathered GBM data for 601 TGFs from August 2008 to August 2011, with most of the events, 409 in all, discovered through the new techniques. The scientists then compared the gamma-ray data to radio emissions over the same period. Lightning emits a broad range of very low frequency (VLF) radio waves, often heard as pop-and-crackle static when listening to AM radio. The World Wide Lightning Location Network (WWLLN), a research collaboration operated by the University of Washington in Seattle, routinely detects these radio signals and uses them to pinpoint the location of lightning discharges anywhere on the globe to within about 12 miles (20 km). Scientists have known for a long time TGFs were linked to strong VLF bursts, but they interpreted these signals as originating from lightning strokes somehow associated with the gamma-ray emission. "Instead, we've found when a strong radio burst occurs almost simultaneously with a TGF, the radio emission is coming from the TGF itself," said co-author Michael Briggs, a member of the GBM team. The researchers identified much weaker radio bursts that occur up to several thousandths of a second before or after a TGF. They interpret these signals as intracloud lightning strokes related to, but not created by, the gamma-ray flash. Scientists suspect TGFs arise from the strong electric fields near the tops of thunderstorms. Under certain conditions, the field becomes strong enough that it drives a high-speed upward avalanche of electrons, which give off gamma rays when they are deflected by air molecules. "What's new here is that the same electron avalanche likely responsible for the gamma-ray emission also produces the VLF radio bursts, and this gives us a new window into understanding this phenomenon," said Joseph Dwyer, a physics professor at the Florida Institute of Technology in Melbourne, Fla., and a member of the study team. Because the WWLLN radio positions are far more precise than those based on Fermi's orbit, scientists will develop a much clearer picture of where TGFs occur and perhaps which types of thunderstorms tend to produce them. The GBM scientists predict the new operating mode and analysis techniques will allow them to catch about 850 TGFs each year. While this is a great improvement, it remains a small fraction of the roughly 1,100 TGFs that fire up each day somewhere on Earth, according to the team's latest estimates. Likewise, TGFs detectable by the GBM represent just a small fraction of intracloud lightning, with about 2,000 cloud-to-cloud lightning strokes for every TGF. The Fermi Gamma-ray Space Telescope is an astrophysics and particle physics partnership and is managed by NASA's Goddard Space Flight Center in Greenbelt, Md. Fermi was developed in collaboration with the U.S. Department of Energy, with important contributions from academic institutions and partners in France, Germany, Italy, Japan, Sweden and the United States.